I am aware that a great many people have found comfort from the publishing empire of books under the heading of Jesus Calling: Jesus Calling for Little Ones, Jesus Calling Bible for Children, Enjoying Peace in His Presence, Trusting in Christ, etc. In fact, there are well over 350 items listed in the online Christian bookstore site cbd.com under Jesus Calling. Obviously, many are so enthralled with this book that they have incorporated it into various aspects of their lives. Some of them are close friends of mine who have tender hearts, who love the Lord and who have read the books because they have desired a more intimate relationship with Him. I know that this report will, therefore, be difficult for them to read. Please know that it is written in love and deep concern for those who have read it. It took a very long time to write it as I struggled to write the truth in love. It also has taken a very long time to put this report in print. In actuality, this report started almost 20 years ago with a book called God Calling. Question: How did you learn to “dialogue” with God? Question: How awkward was it initially to begin a “dialogue” with God? According to Sarah Young, God Calling was the motivating force behind Jesus Calling. For that reason this part of the research paper centers on the problems with God Calling. However, the research goes back even further to the root of God Calling and the leaders of the Buchman Group and the Oxford Group, Frank Buchman and A.J. Russell. Since this information is not of a nature that is normally discussed out in the open when the topic of Jesus Calling/God Calling is spoken of, it may be surprising to the reader. If you will bear with me, all this will come together at the end. Andrew James Russell, editor of God Calling, had become a follower of Dr. Frank Buchman, who founded the Oxford Group, first started under another name in 1921, but taking the name of Oxford Group in 1931. Meeting in groups, this movement emphasized fellowship and receiving direct guidance from God. I am fully aware how shocking it is to read that statement. It was equally shocking to me. Yet the more I researched, as you will see below, the more information I found that confirmed these facts. [A. J.] Russell, his book, For Sinners Only and his form of “guidance” are significant here. 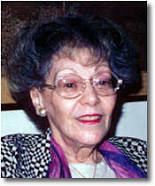 Louis Talbot stated that one “must examine writers such as A.J. 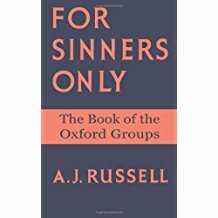 Russell” and his book For Sinners Only to understand the Oxford Group…. When Russell’s For Sinners Only was first published, it was denounced by churchmen as “deplorable” and “dangerous,” but to me the worst thing about it was that it was not clear on the way of salvation…. The atonement was scarcely mentioned (p. 14). To bring this full circle, A.J. 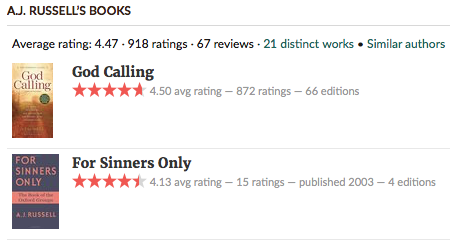 Russell was not only the author of For Sinners Only, the book that inspired the “Two Listeners” who wrote God Calling, but he was also the editor and publisher of God Calling, which went on to become the inspiration for Jesus Calling. Note the word “medium” in the above description by Bulle. What exactly are mediums? And how does the Bible view them? 10 There shall not be found among you anyone who makes his son or his daughter pass through the fire, or one who practices witchcraft, or a soothsayer, or one who interprets omens, or a sorcerer, 11 or one who conjures spells, or a medium, or a spiritist, or one who calls up the dead. 12 For all who do these things are an abomination to the LORD, and because of these abominations the LORD your God drives them out from before you. 13 You shall be blameless before the LORD your God. While the following Scripture may seem like a puzzling one to include in a discussion on God Calling, and subsequently Jesus Calling, it will, sadly, be seen to be very pertinent. As you read the verses, and the accompanying commentary and comments from a well-known discernment writer, Pastor Larry DeBruyn, I think you will understand why I have included the Scriptures. I am including two different Bible versions so that it is apparent that “familiar spirits” and “mediums” are used interchangeably. 19 And when they shall say unto you, Seek unto them that have familiar spirits, and unto wizards that peep, and that mutter: should not a people seek unto their God? for the living to the dead? 20 To the law and to the testimony: if they speak not according to this word, it is because there is no light in them. 19 When someone tells you to consult mediums and spiritists, who whisper and mutter, should not a people inquire of their God? Why consult the dead on behalf of the living? 20Consult God’s instruction and the testimony of warning. If anyone does not speak according to this word, they have no light of dawn. It is wise to consult an established commentary to explain these passages. Each commentary in the website page cited is in agreement with the Barnes Commentary cited below. Isaiah recommends looking to God and the revealed Word rather than to necromancy.Isaiah returns, in ver. 19, to the consideration of his disciples. In the terrible times impending, they will have recourse to necromancy [ed., communication with the dead or spirit world]; he urges that they should look to God and the Law. Verse 19. – Seek unto them that have familiar spirits. In times of great distress the Israelites seem always to have been tempted to consult those among them who pretended to magic and divination. So Saul in the Philistine war resorted to the witch of Endor in 1Samuel 28. [M]ost of us never knew the Bible’s explicit warnings that false Christs and false prophets would arise in our midst and seduce us with supernatural signs and wonders to make us think their teachings came from God. Those signs and wonders would be so convincing that “if it were possible” they would fool even the most faithful believers of the real Gospel and the real Christ. Below is a copy of a letter I sent to a discernment editor I know, and her reply. It is the reason why some information was included in this report. In my regular reading in 1 Samuel yesterday I came upon the story of Saul and the witch of Endor. It dawned on me that the practice of communicating with familiar spirits is very similar to what occurs in God Calling/Jesus Calling. 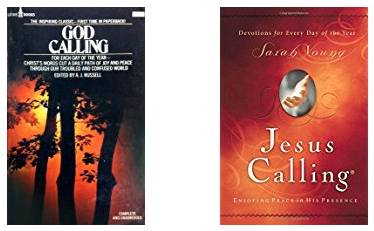 I don’t believe the two “listeners” or Sarah Young are communicating with God. So I think the idea of communication with familiar spirits is a distinct possibility. The warning is plain. There are false voices, impressions, experiences, prophecies, and signs and wonders that cleverly counterfeit themselves to be authentic-experiential encounters with the afterlife. These spiritual experiences can seem genuinely real, perfectly timed and intimately personal as they speak to our needs and comfort our hearts. But even as they may seem to meet our emotional and spiritual needs, we must acknowledge our vulnerability to spiritual deception and therefore measure these experiences by the full counsel of God’s Word, all the while knowing that such encounters are unprecedented in and therefore unsanctioned by Holy Scripture, which reveals to human hearts the true work of the Holy Spirit (See John 5:39; 15:26). Error is like leaven, of which we read, “A little leaven leaveneth the whole lump.” Truth mixed with error is equivalent to all error, except that it is more innocent looking and, therefore, more dangerous. God hates such a mixture! Any error, or any truth-and-error mixture, calls for definite exposure and repudiation. To condone such is to be unfaithful to God and His Word and treacherous to imperiled souls for whom Christ died. While I realize that all the above material is a great deal to take in, the words of Sarah Young herself lend them credence when she admits that the words she receives do not receive their inspiration from the Bible. The question has to be asked, therefore, where does her inspiration come from? Realizing (from page xii of Jesus Calling) that she is claiming that God speaks authoritatively through a source other than His Bible, Sarah Young cautiously amended her words: “I knew that my writings were not as inspired as Scripture is, but they were helping me grow closer to God.” However, the Bible itself contradicts her by affirming that only the Words that go forth out of God’s mouth – the Holy Scripture (Isaiah 55:11) – are inspired, and that “additional inspirations” are not even included in Scripture. Scriptures are not insignificant words to be used casually but are “quick and powerful and sharper than any two-edged sword, piercing to the dividing asunder of soul and spirit, and of the joints and marrow and are a discerner of the thoughts and intents of the heart”(Hebrews 4:12). Sarah Young cannot have it both ways. Either this is God the Son speaking in which case we had better listen because then these daily “guidances” or “inspirations” are equally as important as His Words in the Bible. Or, on the other hand, if this is not God the Son speaking, even in such a relatively insignificant way as compared to the Bible (which is what her quote implies), then why are we listening to these words at all? Yet, as all the preceding material has stated, there is one other disturbing premise: what if this is not Jesus at all speaking? What if it is someone/something totally different speaking? This entry was posted in Postmodern Church/Apostasy on February 28, 2018 by Truth2Freedom.